By Noemi Stauffer, editor of Fresh Fonts — a carefully curated newsletter showcasing the latest and hottest font releases and high-quality free typefaces. Sign up here to get it in your inbox. I believe that good design — and typography — should be accessible to everyone, so I made a list of high-quality typefaces that are available for free, both for personal and commercial projects. All released in the past few months, the majority of these typefaces were made available under the Open Font License, some others, which are not open source, were released for free, and a few more, originally published a while ago, were recently updated and expanded. I grouped them into four categories, according to intended use: superfamilies, display typefaces, text typefaces (including monospace) and typefaces that can do both text and display. Enjoy and don’t forget to ping me on Twitter to show me how you’ve used them, I’d love to see it! Consisting of different subfamilies that are perfect to pair together, these typefaces can serve a variety of needs across print and digital experiences. The new corporate typeface of IBM, Plex, has been released freely under an open source license. Designed by Mike Abbink and Bold Monday, it comprises a Sans, a Serif and a Monospace family, each available in eight weights with italics. A condensed version of Plex Sans was released, too, and several non-Latin scripts will be added in the future. On the occasion of its 50th Birthday, Inria, the French National Institute for Computer Science and Mathematics, commissioned Black[Foundry] to design a new typeface to use in all its communications. Named after the Institute, the typeface was released as an open source project. It is available as a Serif and as a Sans, each with 3 weights and matching italics. Designed by Prague-based Alexander Slobzheninov, this geometric superfamily consists of three subfamilies: Objective, a neutral and clean sans, Subjective, a display typeface with original tails in some of its letters like in the a, j, t and y, and Subjective serif, its serif companion with the same unusual features. Each subfamily is available in eight weights, from Thin to Super, with matching italics. Reforma is a bespoke typeface designed by PampaType for the Universidad Nacional de Córdoba in Argentina, an educational institution more than 400 years old. The typeface is composed of three subfamilies: a classic Serif, a modern Sans, and an intermediate hybrid that combines the qualities of the other two (subtle modulation and flare serifs). 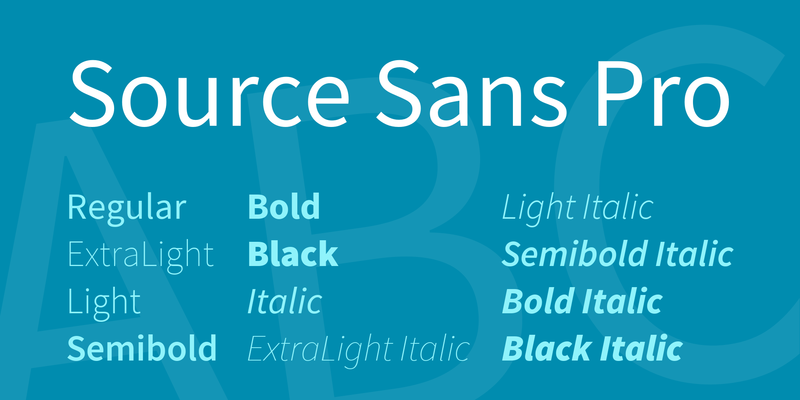 You might already be familiar with Adobe’s first open source font family, Source Sans Pro and its Serif counterpart, since they were originally released back in 2014, and are both available on Google Fonts. However, more recently, Adobe released both families in the Variable Font Format. Open source as well, Source Sans Variable and Source Serif Variable are free to use, and work great together. Syne is a type family designed by Lucas Descroix and Bonjour Monde for Synesthésie, an art center close to Paris. It includes five different cuts that are diverse enough to create fresh and atypical associations among them. For instance, while Syne Regular is a geometric Sans, it features short verticals, and the Monospace font received a special treatment to make its contours unique. Typefaces that can be applied to a wide range of bodies, from display to immersive text. Faune was designed by Alice Savoie as a commission for the Centre National des Arts Plastiques. The typeface comes in Display and Text styles, and draws inspiration from different sources, mostly animal forms and related literature. Faune was released under a Creative Commons license, making it free for personal and commercial projects, provided that the name of the author is credited when using it. bBox Type, the new foundry of Anja Meiners and Ralph du Carrois, just released the first version of FiraGO, a global script extension of Fira Sans (see below) which is another open source typeface from their catalogue. FiraGO currently supports no less than ten scripts: Latin, Cyrillic, Greek, Arabic, Pan African, Hebrew, Georgian, Thai, Devanagari and IPA. On the new website of Berlin-based bBox Type, you will find the updated and final version of Fira Sans, a large open source family designed by Ralph du Carrois in collaboration with erik spiekermann. This massive typeface spans 16 weights across 4 optical sizes, and includes a monospaced version. Coppers and Brasses published Ilisarniq, a typeface designed by Étienne Aubert Bonn for the Kativik School Board — the only school board of Nunavik, Canada — whose education programs are taught in Inuktitut, French and English. As a result, Ilisarniq supports both the Latin alphabet and the Inuktitut Syllabics characters, which were developed with the help of the school community. Velvetyne released a new version of Lack, making it available in Latin, Cyrillic and Greek scripts. Designed by Adrien Midzic, Lack comes in a single weight, with matching italics. However, it now includes three different stylistic sets, and its legibility was optimized, making the display font equally suitable for use at text sizes. Created by Stefan Wetterstrand, Lunchtype started in 2015 to kill time over lunch hours, and has now become a continuous typographic side project: whenever a “boring lunch hour” occurs, he creates a new letterform for it. 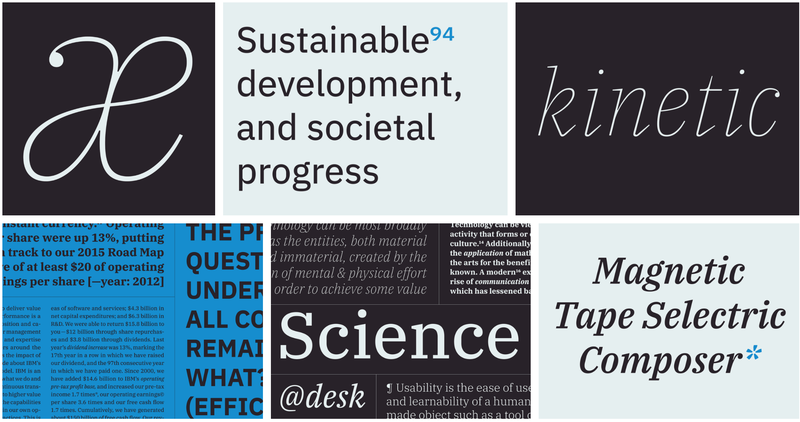 Lunchtype was recently expanded and is now available in 16 styles across three optical sizes. Drawing inspiration from Futura, Jost* is a gorgeous sans serif released by Indestructible Type. Owen Earl did a remarkable job on this one, which could easily pass for a high-end, expensive typeface. You can get all nine weights and their italics for free, or for just $10, get its variable font version. If you’re willing to try, you can also download the source code for the variable font version and build it yourself (instructions provided). Published by Font Fabric, Vision is a clean, geometric sans serif with humanist touch. Perfect for display and small text, the modern typeface is versatile, and provides great legibility in large and short texts. Vision is available in six weights, from Thin to Black, with matching italics, for a total of 12 fonts. In addition, it has extended ligatures, OpenType features and alternative glyphs. Specifically designed for use in large sizes, these typefaces are perfect to create impressive headlines, logos, posters and more. Designed by Jeremy Nelson, Apex Mark 2 is a geometric sans drawing inspiration from classic sans serifs as well as athletic type design. This bold headline typeface features elliptical rounding, giving it personality while not affecting readability. Its simplicity makes it a versatile typeface, ready for a broad range of use. 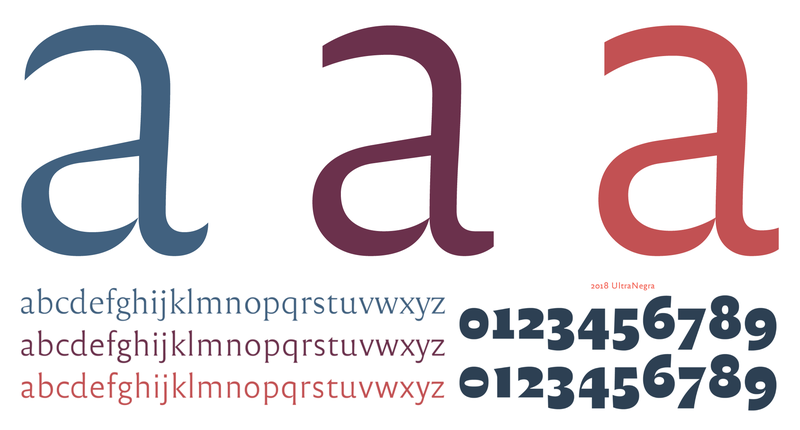 Apex Mark 2 is available in three weights. Published by Font Fabric, Colus is a display font inspired by stone and wooden carved letter inscriptions. The first professional font designed by Stan Partalev, it comes with the support of many Latin and Cyrillic based languages, proper localizations, lining numerals and old style figures. This free Fat font was created by Thom Niessink, and is exactly what you’d expect — it’s fat and it’s free. With its extremely heavy weight and many unique characters, Free Fat Font is perfect for big titles, advertising, labelling, packaging and anything that could use loud and impactful typography. Free Fat Font also comes with extended language support. Developed by Andrés Torres, Facultad is an institutional typeface designed for use in the headlines of the Faculty of Arts of the University of Cuenca, Ecuador. Currently available in only one weight (Regular), the humanist sans is meant to be expanded into a type family that will include several weights and variants. Marvin Visions is a retro science fiction typeface for display use. Originally designed in 1969, it has been reinterpreted by Mathieu Triay for the identity of Visions, a science fiction magazine that aims to introduce the genre to a wider audience. Only exception to this list, Marvin Visions is only free for personal use. For commercial use, you will need to buy a license ($25). Released by Indonesian foundry Tokotype Foundry, Mohave is a titling display typeface. Initially designed as an all-caps font in 2013, Mohave was just expanded into a family of four weights, with matching italics. The new version also includes alternates, both in the uppercase and lowercase. Designed by Kostas Bartsokas, Oi! 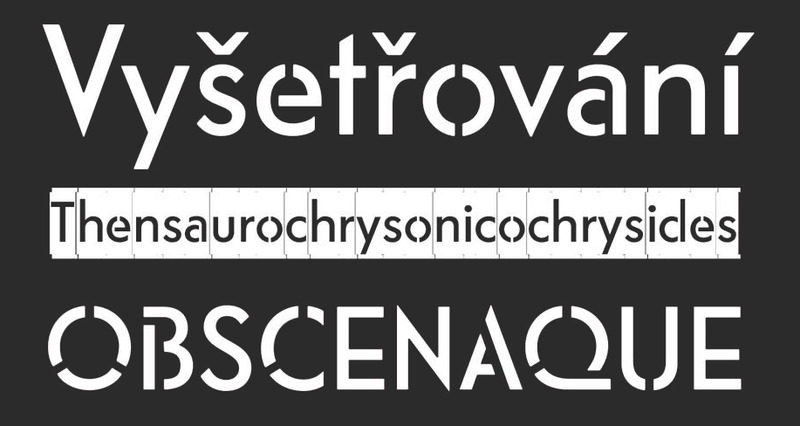 is an ultra-fat display typeface that draws inspiration from grotesque slab serifs. Oi! supports Latin and Greek, and comes in two styles: regular and shadowed. Interestingly, Oi! started off as an assignment given by Gerard Unger. Read the full story. Published by Monokrom, Riks is a stencil typeface available in two styles: Normal and Negativ. The typeface was inspired from the die cut lettering found on Norway’s iconic red phone booths (designed in 1932 by Georg Fredrik Fasting) applying the stencil logic of its ‘O’ to the entire character set. Riks is free for personal and commercial use through its gratis license, but if you’d rather support the foundry’s work, you can pay for the typeface and get it under another license. Released by French foundry Velvetyne Type, Trickster is an open source typeface designed by Jean-Baptiste Morizot (Skulls’n’Type). Its quite unusual design was inspired by medieval calligraphy as well as street graffiti, which is particularly apparent in the dripping feelings of its alternate version. If you want to learn more about Trickster, Jean-Baptiste shares his design process in this interesting post. Typefaces optimized for readability at small sizes, such as in body text. Happy Times at the IKOB is a contemporary take of Times New Roman, designed by Lucas Le Bihan as a custom typeface for the new visual identity of the IKOB, a museum of contemporary art located in Eupen, Belgium. The typeface is available in two styles, Regular and Italic, and you can already see what it looks like in use on the website of the museum. Rasmus Andersson’s Inter UI is an open source typeface specially designed for user interfaces, providing a high legibility of small-to-medium sized text on computer screens. The typeface currently includes four weights (Regular, Medium, Bold and Black) and their italics, for a total of eight styles. Inter UI also comes with several alternate characters, and support for Latin and Cyrillic languages. Designed by Tyler Finck, League Mono was released by The League of Moveable Type, and now consists of eight weights of monospace fun. In addition, Tyler spent the past few months converting League Mono to a variable weight and variable width font. You can read more about his process in his interview with TypeThursday. Now completed, League Mono Variable is also available to download for free. Markazi text is a multi-script typeface inspired by Tim Holloway’s Markazi typeface (ATypI award 2001), with his encouragement, and initiated by Gerry Leonidas as a joint University of Reading and Google project. The Arabic typeface was designed by Borna Izadpanah, while its complementary Latin version was designed by Florian Runge. Both Arabic and Latin scripts are available in four weights with extended language support, and are suited for print and screen. A variable font of the typeface was also made, which can be downloaded together with the other styles. Commissioned by Google Fonts, Spectral is a versatile serif designed by Production Type. The screen text typeface is available in seven weights with matching italics. Also, Spectral can be used as a starting point to create bespoke fonts, since you can tweak more than 30 of its parameters in Prototypo. Fresh Fonts is a newsletter dedicated to promoting the work of independent type designers and small foundries. We send an email twice a month with new releases, high-quality free typefaces and discount codes. Sign up here to get it in your inbox.